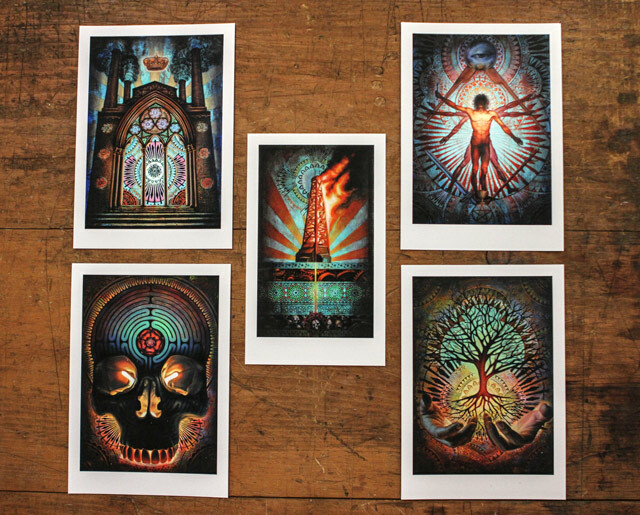 1xRun: Tell us a little bit about the images chosen for this set. Beau Stanton: The five images in this print portfolio represent a broad selection of the most iconic paintings from my upcoming show, Arcane Archetypes at Last Rites Gallery on June 29th. My first intention with this body of work was to create a series of images that instill a lasting imprint into the viewer’s subconscious. As an initial point of departure I started to research one of the most recognizable and iconic sets of images, the Major Arcana of the Tarot. After studying several existing decks, I discovered that some of the images shared common ground visually and conceptually with several paintings I had created in the past. This lead me to fuse elements from both my existing visual language and the ancient iconography of the Tarot to construct a revived interpretation of the Major Arcana. As the series progressed, entirely new images developed out of the process incorporating symbols from Alchemy, Freemasonry, and other forms of Ancient Mysticism resulting in a series of paintings excavated from the past and re-imagined for the present. Although the images of the Tarot are widely known and instantly recognizable, the reason for their visual potency and lasting impact is rarely understood by the uninitiated. In Arcane Archetypes, I aim to present these images in a contemporary way in order to provide some insight into their meaning and potential as extremely dense communicative devices. 1xRUN: What materials were these pieces created with? Beau Stanton: All five images were created with oil and acrylic on cradled wood panel. 1xRun: When were these pieces drawn and created? 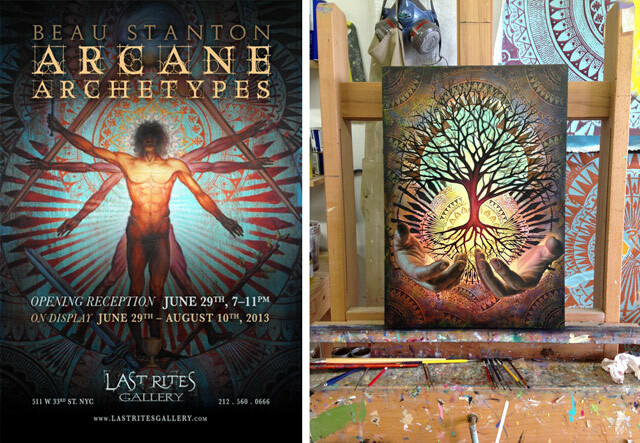 Beau Stanton: They were all made in the last four months in preparation for my Arcane Archetypes exhibition at Last Rites Gallery in New York City. Beau Stanton: The images in this set are all interpretations of Tarot cards viewed through the lens of my visual language. I thought it would be great to create a small set of prints packaged together in a custom screen printed box for collectors to be able to take away a mixed assortment from the show. 1xRun: How long did these paintings take to create? Beau Stanton: Each one took between five and seven days to complete. 1xRun: What is unique about this set compared with some of your other work? Beau Stanton: This is the first time I have offered a print set, it comes in a custom box that I screen printed in my studio. 1xRun: Why should people buy these prints? Beau Stanton: All five images in the set are hand picked to complete a balanced arrangement of my favorite images, packaged together in a hand made screen printed box. 1xRun: Describe this set in one gut reaction word. 1xRun: What else have you been up to lately? Beau Stanton: Last month I was in Hamburg, Germany painting a mural in Millertor Football Stadium for a fundraiser for an NGO called Viva Con Agua de Sankt Pauli. When I got back I painted a mural in Bushwick, Brooklyn over Bushwick Open Studios weekend. Since then I’ve just been working non stop finishing the rest of the work for my upcoming exhibition, Arcane Archetypes, at Last Rites Gallery opening June 29th.